Starting a two-day visit to Israel on Wednesday, US President Barack Obama issued bellicose threats against both Syria and Iran. The visit, which plainly has the character of a US-Israeli war council, makes clear that 10 years after the US invasion of Iraq, US imperialism is preparing even greater crimes in the Middle East. The Democratic president threatened the Syrian regime of Bashar al-Assad that it would "be held accountable for the use of chemical weapons or their transfer to terrorists," adding that if evidence showed that such a weapon had been used it would be a "game-changer." On Iran, Obama repeated his vow "to prevent Iran from having a nuclear weapon" and that "all options are on the table," while recognizing Israel's "right" to take unilateral action against Iran. There "is not a lot of daylight" between the US and Israel on Iran, he said. Obama's remarks came one day after the tenth anniversary of the US invasion of Iraq. No speeches or ceremonies were organized by the Obama administration or the US Congress Tuesday to mark the onset of a war to which 1.5 million Americans were sent, and where nearly 4,500 died and hundreds of thousands suffered either physical or psychological wounds. America's ruling elite is now pressing for even greater and more destructive conflicts, in the face of mass public opposition to war. 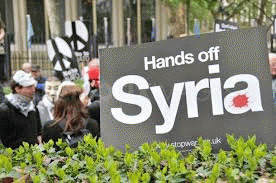 In Orwellian fashion, familiar and discredited pretexts of "weapons of mass destruction," terrorism and the promotion of "democracy" are being recycled, this time to justify war against Syria. On Capitol Hill there was a drumbeat of calls for new Middle East wars. Adm. James Stavridis, the chief of the Pentagon's European Command, testified before the Senate Armed Services Committee Tuesday on extensive planning by NATO for intervention in Syria. "We are looking at a wide range of operations, and we are prepared if called upon to be engaged as we were in Libya," he said. Under serious consideration, according to Stavridis, is the establishment of a "no-fly zone." Calls for such a no-fly zone in Libya, approved by the United Nations Security Council in March 2011, led to a US-NATO bombing campaign and war for regime change. The committee's chairman, Senator Carl Levin, (Democrat, Michigan) led the questioning. The day before, he had spoken at the Council on Foreign Relations, calling for the establishment of "a protected zone along the Turkish-Syrian border" and the use of military force to "go after some Syrian air defenses and after some of the Syrian air power." Resolutions were introduced in both the House and the Senate calling for stepped-up arming and training of Western-backed "rebels" fighting to overthrow Assad. Lawmakers invoked Obama's earlier threats that the use of chemical weapons in Syria represented a "red line" that would prompt US intervention. "If today's reports are substantiated, the President's red line has been crossed, and we would urge him to take immediate action to impose the consequences he has promised," Republican Senators Lindsey Graham and John McCain said in a joint statement.